It’s Wednesday! That means four new #1s that dropped today, reviewed for your pleasure. And I’ll say upfront, this week’s books are much better than last week’s lot. I’d like to add, for what it’s worth, there were only a handful of #1s this week for those of you looking for some water-cooler chat. I must admit, this was my final pick in my search for the fourth title to review. I’m not a big Terminator fan, but the action, at a glance, looked cool, so I gave it a shot. It’s nothing special. 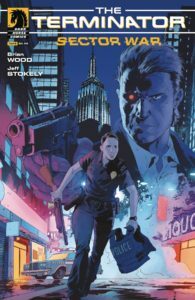 The writing is thin, with the book basically taking the premise of the original Terminator and placing it on the opposite coast, with a Terminator looking for a woman to keep her from giving birth to a rebel leader. The art is also nothing to write home about. While it isn’t terrible, it feels quickly done and non-consistent. I’d skip this one, but if you are a Terminator junkie, you’ll want it for your collection. A shame, I normally dig Dark Horse titles. Jinxworld is an imprint of DC. I did not know that, so I inadvertently reviewed a couple “big two” books today. 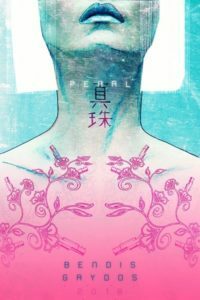 Pearl begins with a good amount of mystery and intrigue as a young girl with a unique spider tattoo has that tattoo’s artist recognized by a young man, throwing into motion a crazy action sequence in which we find out that she is more than meets the eye. The art is very pulp and dark with lots of sickly greens and blues covering the pages. It’s a Bendis and Gaydos title, so many of you will rush to get it based on that alone, but I’m not sure if I’m sold from this issue. The second half doesn’t hit as hard for me, and if I’m adding one title to the pull-list today, Pearl does not make it. There’s a six-page noir Batman story in the back of the issue that feels out of place to me. I guess it’s cool, but if I’m supposed to be immersed into the story of Pearl, give me Pearl. Don’t take me out of my though process on this unique story by slapping a bonus Batman story at the end. Poor planing. You might like the bonus material, but I think it took away from the issue. With not many new #1s coming out this week it was hard to pass up a cool looking Spider-Man title. 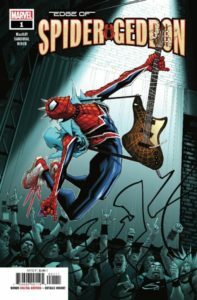 Spider-Geddon is a Spider-Man from Earth-138 (if you don’t know what that means, it’s cool, don’t worry). He is a punk rocker with spikes, a leather jacket, and a baseball bat. He’s a neat character; this was my first exposure to him since I’m not into event books and the such. And as much as I enjoyed reading this issue, when I was done, I didn’t feel the need to read the next issue, like most of the Marvel that I’ve been reading, the story feel a bit stale. Marvel is really showing us that there is nothing new under the sun. Not a complete loss but ultimately forgettable…sorry y’all, I really wanted to like this more than I did. Welcome to my Best if the Four this week! Image is showing the rest how it is done. 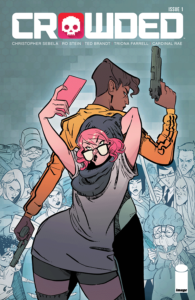 An interesting story with interesting characters and fun art, I’m in for the long haul. This one’s getting added to the pull-list. Set in a not-to-distant future, Charlie, a woman juggling a very strenuous life, finds herself on the wrong end of a campaign: a crowd-funded contract kill. Vita quickly becomes her hired muscle as they quest for the truth while attempting to keep Charlie alive. It’s funny. It’s interesting. It’s set in a world that lives in a place that’s both familiar yet innovative. Check this one out!